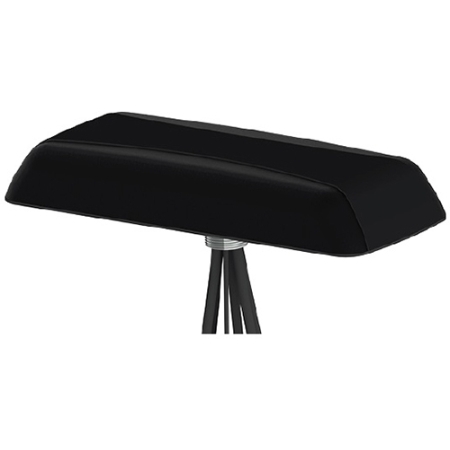 Mobile Mark’s LLP502 Series Multiband Diversity/MIMO antenna contains five separate antenna elements, all in one compact antenna housing: two broadband LTE/Cellular antennas, four dual-band WiFi antennas, and one GPS antenna. The LLP502 covers Cellular LTE frequencies from 694-3700 MHz. With seven elements, the new LLP702 antenna is ideal for fleet management systems that combine GPS with both an LTE 2x MIMO modem as well as a WiFi 2x MIMO Modem. Measuring 9” (22.8cm) x 3.5” (8.9cm) with a low profile of 1.25” (3.18cm), the LLP702 series antennas take up significantly less space than multiple antennas. The radome is available in black and white . The antennas can also be configured for combined GPS & Glonass use.